Interact with Skippyjon Jones in his first Sticker Stories! 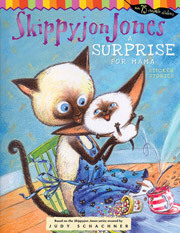 Skippyjon Jones wants to show Mama Junebug Jones just how much he loves her by giving her the perfect present. A card? Her favorite meal? Young readers will love to interact with the story by adding different stickers to each spread.